This past week had a first for me – I signed up for a CSA. I resisted for a long time because I had visions of seasonal vegetables languishing in my fridge. But we’ve been pretty good for the last few months about not letting our fresh veggies see too much of the inside of the crisper. This is largely because our wonderful nanny agreed to chop vegetables for me. It doesn’t sound like it would save much time but it really does. Once or twice a week, I ask her to wash and chop a variety of vegetables and when I get home from work it makes throwing together dinner in thirty minutes much easier. Kale is one of those vegetables that never goes to waste in our house. Either I toss it into a pasta, crisp it into chips (which then get tossed on top of noodles) or mix it into a pot of lentils or soup. But until recently I had never had it raw. I thought it would be rubbery and bland – a stuck in my throat kind of experience. Then I had a raw kale salad at ABC Kitchen. Their kale salad was spicy and zingy and quite the opposite of a rubbery, bland, stuck in my throat kind of experience. The amazing thing about the salad is that it was really simple but stuck clearly in my mind for the last few months begging to be re-created. The tender kale leaves are earthy and get a jolt from fresh mint and cilantro along with lemon and then a real kick from thin jalapeño matchsticks hiding in the leaves. Even Surya joined in on the raw kale noshing, which is a feat because recently she’s been outright rejecting anything green and leafy. I suspect it had a lot to do with the lemon. 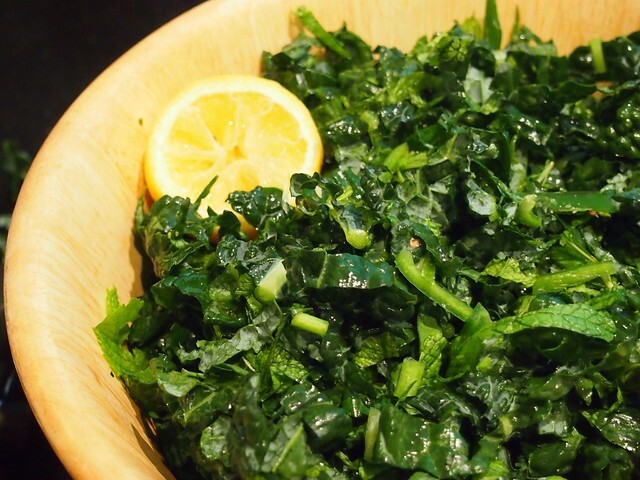 This raw kale salad is super simple and really flavorful. When buying kale, look for lacinato kale (Tuscan kale) or a bunch that has smaller leaves since it will be more tender. The fresh mint and cilantro add a nice jolt which is stepped up even more by the lemon. The thin pieces of chili are like a lion hiding in the brush - they blend into the kale mixture and really surprise the tastebuds when you fork one into your mouth. A perfect pairing all around. Toss the kale, mint, cilantro and chili pepper matchsticks in a large bowl until well mixed. In a small bowl, make the dressing by mixing the lemon juice, olive oil and salt and pepper (to taste). Drizzle the dressing over the kale mixture and using your hands, toss so that the kale mixture is well coated. If you make this ahead of time, store it in the fridge until ready to serve. It tastes great cold. If you’re looking for dinner party menu inspiration, I served the kale salad with this savory, cheesy eggplant parmesan and creamy lemon spaghetti. I thought the same thing about kale salad, but was likewise pleasantly surprised when I first tried it out. I can’t wait until kale is back in season here (too hot right now) and I can try this one out! HI – I”m dying to try the lemony kale salad recipe, but for some reason, the recipe doesn’t pull up on the page? Can you help me? Thanks! Hi Katie, so sorry but it should be working. Email me at nithyadas1 @ gmail (dot) com me know if you can’t access it.